Wish I Was Here is a 2014 American comedy-drama film directed by Zach Braff and co-written with his brother Adam Braff. The film stars Zach Braff, Josh Gad, Ashley Greene, Kate Hudson, Joey King and Mandy Patinkin. The film had its world premiere at the Sundance Film Festival on January 18, 2014 and was given a limited release on July 18, 2014 by Focus Features. When Gabe reveals his cancer has come back, he tells Aidan that he's decided to put the rest of his money into a new stem cell treatment, meaning his grandchildren can no longer afford to attend their school. After the school refuses to provide any aid to the Blooms, Sarah suggests that Aidan homeschool his kids, and their adventure of self-discovery begins. Through teaching them about life his way, Aidan gradually discovers some of the parts of himself he couldn't find. His brother Noah (Josh Gad) is a shut-in who can only be bribed to babysit for his brother and refuses to see his dying father, from whom he is estranged. Noah falls for his neighbor Janine (Ashley Greene) who is a furry costume maker, which gives him the idea to impress her by making a costume for Comic-Con. 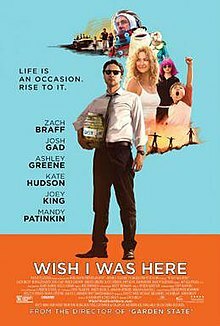 On April 24, 2013, director Zach Braff launched a Kickstarter campaign for his comedy film Wish I Was Here, aiming to make $2 million to boost the project, based on a script he co-wrote with his brother Adam J. Braff. Cinematographer Larry Sher was set as director of photography and producers Michael Shamberg and Stacey Sher were set to produce the project. The campaign raised $2 million 3 days after the project was launched. On May 15, 2013 Worldview Entertainment stepped in to gap finance the project, which at that point had raised over $2.6 million. On May 24, 2013 the campaign ended, having raised $3,105,473 from 46,520 people. At the film's New York premiere, actress Joey King stated that she donated money to the film on Kickstarter before she was even attached as a cast member. At the time the Kickstarter was launched, Zach Braff and Jim Parsons had already been cast. Braff plays Aidan Bloom, a struggling actor, husband and father trying to find his purpose. On May 14, 2013, Mandy Patinkin joined the cast, playing Gabe Bloom, Aidan's father. Josh Gad also joined the cast to play the role of Aidan's brother. On May 15, Anna Kendrick signed on to play Janine, a young woman who is into Cosplay. Kate Hudson joined on May 20 to play Sarah Bloom, Aidan's wife. Joey King was set to play Grace Bloom, the 12-year-old daughter of Aidan and Sarah Bloom, on July 2, 2013. Pierce Gagnon was added to the cast on July 9, to play Tucker Bloom, son of Aidan and Sarah. On July 17, it was announced that Ashley Greene would replace Anna Kendrick as Janine. Principal photography took 25 days, beginning on August 5, 2013 in Los Angeles and ending on September 6, 2013. The film's first trailer was released on April 9, 2014. The film had its world premiere at the 2014 Sundance Film Festival in January 2014, 10 years after the premiere of Braff's directorial debut Garden State. Focus Features bought the distribution rights for $2.75 million. After its opening at Sundance, it was announced that the film would open on July 18, 2014, exclusively in New York and Los Angeles. The release ended up a bit wider, playing in 68 theaters during its opening weekend. The release then expanded on July 25. The special preview screening in London was attended by Kate Hudson and Zach Braff on September 18, 2014. Wish I Was Here received mixed reviews from critics. On Rotten Tomatoes, the film holds a rating of 44%, based on 117 reviews, with the site's consensus reading: "There's no denying Wish I Was Here is heartfelt, but it covers narrative ground that's already been well trod – particularly by director Zach Braff's previous features." On Metacritic the film has a score of 43 out of 100, based on 34 critics, indicating "mixed or average reviews". The soundtrack for the film includes an original song by The Shins, an original song by Bon Iver, and an original title track by Coldplay, recorded with Cat Power. ^ "WISH I WAS HERE (15)". Koch Film. British Board of Film Classification. July 28, 2014. Retrieved July 30, 2014. ^ "Zach Braff's Wish I Was Here is becoming a PR nightmare". Flavorwire.com. Retrieved November 15, 2014. ^ "Wish I Was Here". Boxofficemojo.com. Retrieved November 15, 2014. ^ a b c d e f "Zach Braff Explains Why He Turned to Kickstarter for New Indie Film". hollywoodreporter.com. April 24, 2013. Retrieved August 11, 2013. ^ "Sundance 2014: World Cinema Dramatic Competition". Retrieved May 5, 2014. ^ a b "Kate Hudson Joins Zach Braff's Kickstarter Movie 'Wish I Was Here'". deadline.com. May 20, 2013. Retrieved August 11, 2013. ^ a b "Joey King Joins 'Wish I Was Here'". deadline.com. July 2, 2013. Retrieved August 11, 2013. ^ a b "'Looper's Pierce Gagnon Joins 'Wish I Was Here'". deadline.com. July 9, 2013. Retrieved August 11, 2013. ^ a b "Mandy Patinkin Joins Zach Braff's Kickstarter Pic 'Wish I Was Here'". deadline.com. May 14, 2013. Retrieved August 11, 2013. ^ a b "Josh Gad Joins Zach Braff's 'Wish I Was Here'". variety.com. May 15, 2013. Retrieved August 11, 2013. ^ a b "Ashley Greene In For Anna Kendrick On Zach Braff's Kickstarter Pic 'Wish I Was Here'". deadline.com. July 17, 2013. Retrieved August 11, 2013. ^ "Zach Braff Launches Kickstarter Campaign For New Directorial Effort 'Wish I Was Here'". indiewire.com. April 24, 2013. Retrieved August 11, 2013. ^ "Zach Braff's 'Wish I Was Here' Kickstarter Hits $2 Million Goal In 3 Days". deadline.com. April 27, 2013. Retrieved August 11, 2013. ^ "Zach Braff Kickstarter Project Gets Gap Financing". variety.com. May 15, 2013. Retrieved August 11, 2013. ^ "Zach Braff Ends $3+M Kickstarter Campaign". deadline.com. May 24, 2013. Retrieved August 11, 2013. ^ Lewis, Hilary (July 15, 2014). "'Wish I Was Here' N.Y. Premiere: Zach Braff, Cast on Kickstarter Benefits, Character Draws". hollywoodreporter.com. Retrieved July 16, 2014. ^ "Mandy Patinkin Joins Zach Braff's 'Wish I Was Here'". variety.com. May 14, 2013. Retrieved August 11, 2013. ^ "Anna Kendrick Joins Zach Braff's 'Wish I Was Here' Kickstarter Movie". thewrap.com. May 15, 2012. Retrieved August 11, 2013. ^ "Zach Braff kick-starts filming on the set of Wish I Was Here after raising $3.1 million online". dailymail.co.uk. August 8, 2013. Retrieved August 10, 2013. ^ "Zach Braff's 'I Wish I Was Here' begins filming in Los Angeles". onlocationvacations.com. August 8, 2013. Retrieved August 10, 2013. ^ Sciretta, Peter (April 9, 2014). "Zach Braff's 'Wish I Was Here' Teaser Trailer". slashfilm.com. Retrieved April 10, 2014. ^ "2014 Sundance Film Festival Adds Wish I Was Here by Zach Braff to Premieres". Sundance.org. Retrieved November 15, 2014. ^ Stewart, Andrew (January 19, 2014). "Zach Braff's 'Wish I Was Here' Bought by Focus Features". variety.com. Retrieved January 20, 2014. ^ "Zach Braff's 'Wish I Was Here' Gets Focus Release Date". indiewire.com. February 27, 2014. Retrieved March 7, 2014. ^ "Ikon London Magazine coverage from the London Special Screening". Ikon London Magazine. September 18, 2014. Retrieved March 8, 2018. ^ "Wish I Was Here". Rotten Tomatoes. Retrieved September 7, 2015. ^ "Wish I Was Here Reviews". Metacritic. Retrieved November 15, 2014. Wikimedia Commons has media related to Wish I Was Here. This page was last edited on 28 December 2018, at 09:43 (UTC).